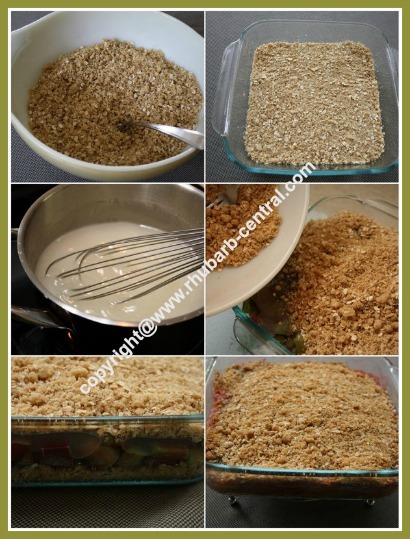 This Easy Rhubarb Crumble Cake Recipe is one of those "old fashioned recipe favourites". It is made in a square baking dish. If you love rhubarb crumble ... you will love this cake! 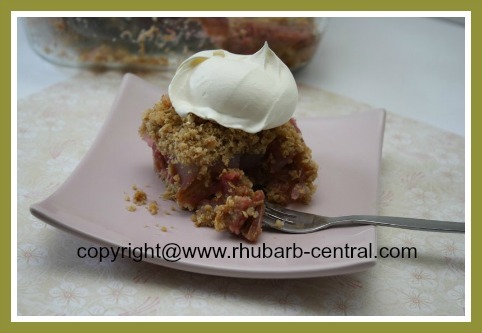 You can make this rhubarb cake using fresh OR frozen rhubarb! Served with a dollop of ice-cream, Greek yogurt or whipped cream, the taste is scrumptiously scrumptious indeed! Sort of like a crumble ... sort of like a cake! Most of all - so delicious! 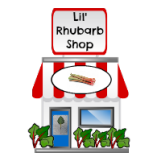 Note - You can use fresh or frozen rhubarb for this recipe. If you use frozen rhubarb, thaw it first in a sieve over a bowl, and discard the excess liquid. 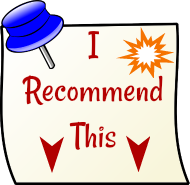 In a medium bowl, combine the melted butter and the brown sugar and mix together with a fork. Add the flour, rolled oats, cinnamon and salt and mix until well combined and crumbly. Press half of the mixture into a 8" x 8" greased baking dish. 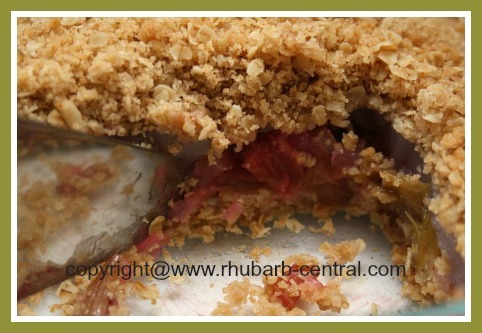 Arrange the rhubarb over top of the crumb mixture. In a large pan (large because you will be adding the chopped rhubarb to the pan as well), whisk together the granulated sugar and the cornstarch. Slowly stir (using the whisk) the boiling water into the sugar and cornstarch mixture, and on medium-high heat bring mixture to a boil and cook, stirring with a whisk constantly; to avoid sticking and burning, cook until thickened, about 2 minutes. Remove the mixture from the heat and stir in the vanilla extract and the chopped rhubarb. Pour the rhubarb mixture over the crumble base in the baking dish. 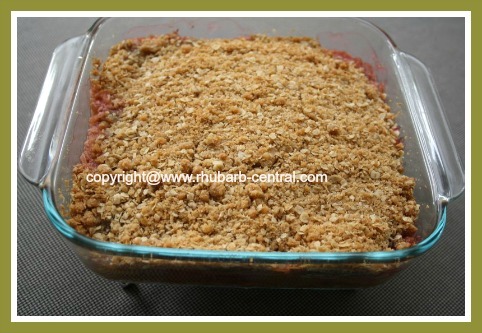 Sprinkle the remaining crumb mixture over top of the rhubarb. Bake at 325° F for about 1 hour, or until the topping is golden brown in colour, and the rhubarb is tender. (I applied a piece of foil paper over the cake in the oven after it had baked for 40 minutes to prevent the crumble top from becoming too dark). 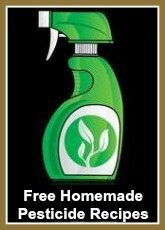 Serve warm or cooled, plain, or topped with a dollop of ice cream, Greek Yogurt or whipping cream (optional). 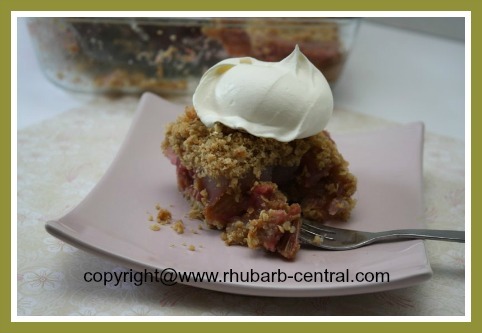 Enjoy this scrumptious cake recipe for rhubarb!